PHILADELPHIA, PA – June 14, 2018 – Janney Montgomery Scott LLC (“Janney”), a leading full-service wealth management, financial services, and investment banking firm headquartered in Philadelphia, PA, is pleased to announce that The Gormley Furlong Wealth Advisory Group, an eight-person team, has joined the firm in Newtown, PA. The team was previously affiliated with Stifel. The advisors of The Gormley Furlong Wealth Advisory Group have over 100 years of combined financial services experience. They include Timothy P. Gormley, CFP®, Executive Vice President/Wealth Management; Paul M. Furlong, Executive Vice President / Wealth Management; Kevin M. Keane, AAMS®, AIF® Vice President / Wealth Management; and Kathleen M. Zelenka, Financial Advisor. They will be joined by Amber Heary, Registered Private Client Associate; William A. Heinz, Private Client Associate; Diane Kowalko, Private Client Associate; and Laura Casey, Private Client Associate. Timothy P. Gormley, CFP®, Executive Vice President/Wealth Management – Mr. Gormley is a 23-year industry veteran and a founding member of The Gormley Furlong Group. He holds both the Certified Financial PlannerTM and Certified College Planning Specialist® designations. A former Radio Talk Show Host of “Your Money Matters,” he is a frequent speaker for various corporate and community groups. He graduated with a BS in Finance from the University of Connecticut. Paul M. Furlong, Executive Vice President / Wealth Management – Mr. Furlong is a 26-year industry veteran and a founding member of The Gormley Furlong Group. A former Radio Talk Show Host of “Paul Furlong & Your Money Matters,” he is an enthusiastic educator and a speaker for various national, state and local businesses, organizations and unions. He received a BS in Finance from LaSalle University and is an active alumnus. Kevin M. Keane, AAMS®, AIF® Vice President / Wealth Management – Mr. Keane, a 35-year industry veteran, holds the Accredited Investment Fiduciary (AIF®) and Accredited Asset Management SpecialistSM designations. He graduated with a BS in Business Management from LaSalle University. Kathleen M. Zelenka, Vice President / Wealth Management – Ms. Zelenka has over 20 years of financial services industry experience. She is involved in a number of local civic and charitable organizations. She has been an active member of the Lower Bucks County Chamber Commerce since 1995, having served as Chair of the Board from 2015–2016. She remains on the Board and is an active member of the Finance Committee and Professional Speaker’s Bureau. She further serves the community as a member of the Board of Directors of the Lower Bucks Family YMCA. 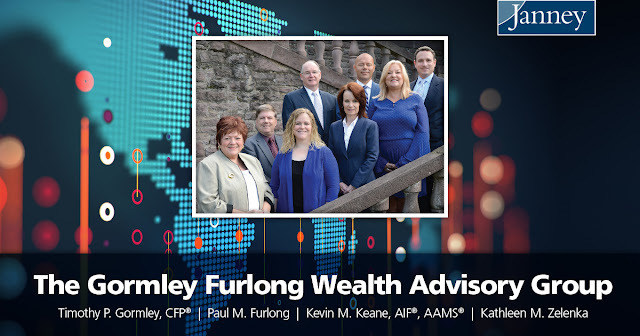 The Gormley Furlong Wealth Advisory Group’s office is located at 1020 Stony Hill Road, One Lower Makefield Corporate Center, Suite 150, Yardley, PA 19067.